Taking the idea of a “Check-in” to its literal conclusion, IMGuest is a location-based service that aims to get like-minded hotel guests networking. The product of an Israeli team, the idea itself is simple enough as a networking tool. You’re a traveler who likes to meet new people and IMGuest lets you see other users who are currently staying at the same hotel as you. Once you’re signed up, you fill out your profile with details of your professional background and interests. Once you “check in” at a hotel, you mark whether you’re there for business or pleasure and optionally tap in a brief note about who you’d like to meet. Everyone else at the hotel can then see who else is currently checked in, helping them maximise their potential networking while they’re there. Both personal and business networking are supported by the service, although it ‘feels’ built more for business that the casual market. 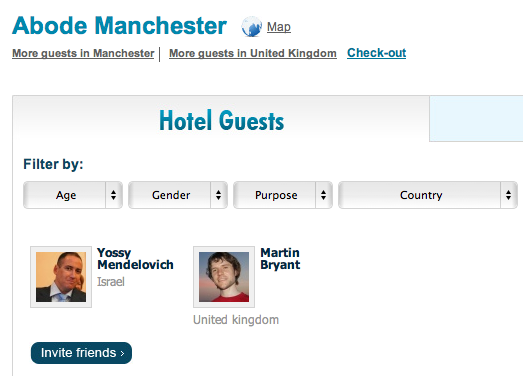 To enhance longer-term networking potential, you can mark ‘favorite guests’ and follow them. You’ll then get email notifications when they are checked in nearby in the future, wherever you are in the world. So, why not just do all your location-based networking on an existing service like Foursquare? IMGuest co-Founder Yossy Mendelovich explains that “In Foursquare you do the same virtual check-ins to places like coffee shops, bars and restaurants. You really don’t have enough time to meet other people because you have only a couple of hours the tops to stay in venues, and to make real interactions you’ll need much more time than that.” Mendelovich argues that IMGuest solves that problem with its focus on longer check-ins, or “check-arounds” as it calls them. As an idea, it’s remarkably similar to Planely. That Danish startup, one of our 10 European startups to watch in 2011, is taking the same approach with networking on flights. IMGuest could definitely learn from Planely’s focus on future plans. If I’m planning my hotel stay for an out-of-town stay, I’d prefer to make my choice based on the networking opportunities. Once I’m actually there and checked in at some godawful hotel that none of the movers and shakers are at, it’s too late. 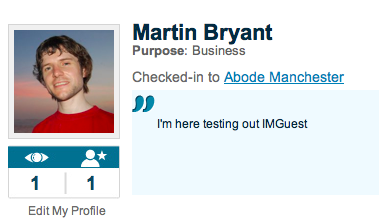 IMGuest also offers an enhanced service to hotels that are willing to pay. The benefits of this are an interactive message section which allows them to award guests with benefits and rewards for using the service and ‘real-time stats’ about their guests. 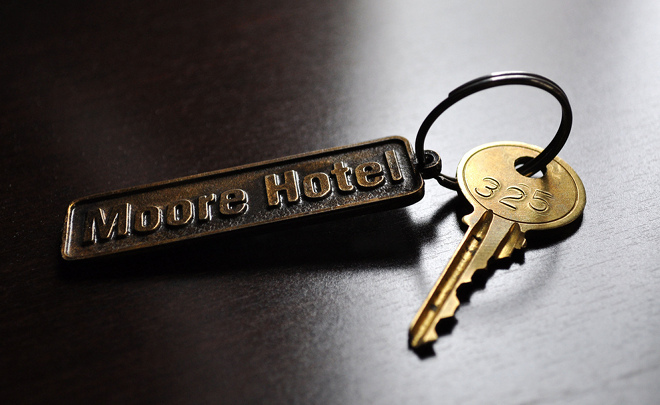 However, seeing as guest have to literally check in to a hotel and fill out a form containing personal information in order to get their room key, we’d guess that most hotels know when they need to about their guests already. Still, there’s definitely real merit in focused networking tools like IMGuest and Planely and it’s certainly an area to watch this year as services like this develop.